BOLD STROKES: The award-winning artist making magic on the canvas inside his St. Andrew-based studio. It is a truth universally acknowledged that, for creative artists, you just never know where inspiration will spring from. More often than not, it emerges from the unlikeliest of places. Just ask Lennox Coke. 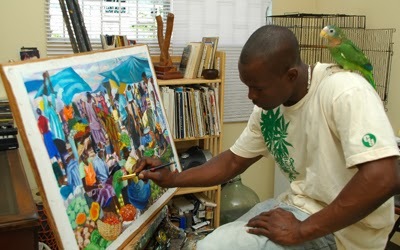 "I particularly like the marketplace because it is a composite of people from all different aspects of the society," says the exemplary visual artist, best known for vivid, eye-catching paintings that reflect the myriad ways in which Jamaicans live their dynamic and endlessly fascinating lives. "And I feel that if a society should ever lose its culture, in the markets is where you're gonna find the last remnants because culture is so deep in there." Coke, whose paintings have shown up in solo and collective exhibitions from here to London, across the Caribbean and the United States, comes by this street-wise outlook quite honestly, having been raised on a farm in St. Elizabeth where his parents (both farmers) cultivated a wide range of ground produce and reared livestock. "I'm very connected to cultivation," he says. Little wonder then that it continues to inform his life's work. "What I want to portray through my work is Jamaican culture in its living breathing form so day-to-day life is important to me," says the artist, who runs a home studio along Shortwood Road in Kingston and is a multiple gold medal winner in the JCDC Visual Arts Competition. Equally determined to give back to society, each year finds him contributing some of his best pieces to be used for the Christmas card initiative that represents a major fundraiser for the STEP Centre, a Kingston-based school for kids with special needs. Soon to turn 40, Coke is keeping busy and challenging himself as he prepares for upcoming exhibits, including a one-week show set for next week in Tryall, Hanover, and the much-anticipated Liguanea Art Festival slated for June 1. And, if the logistics work out, he'll be mounting his next overseas solo show somewhere in the States this summer, a time of year when there's always something fresh and exciting to inspire an artist's wandering eyes.